click here for full photo slide-show of 60 photos! Cliffe started the game at a fast pace and had Bubwith reeling from kick-off but the visitors took the lead against the run of play when Jamie Hawksworth, possibly feeling sorry for the visitors poor start, put the ball into his own net. 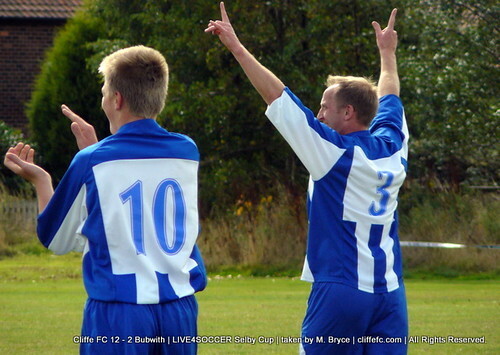 Cliffe were level soon enough when Ben Rawson scored before Tom Hogg made it 2-1 to Cliffe. A Luke Crowther brace, one screamer and a penalty, made it 4-1 and Hogg managed a second before half-time at 5-1. Cliffe didn’t let up the onslaught after the break and Hogg had his hat-trick for 6-1 and the seventh Cliffe goal saw Crowther grab his hat-trick. Kev Taylor is credited with Cliffe’s eighth goal and after numerous dazzling runs Shane Cawkill made it 9-1 before Sim Leach, who was Cliffe’s acting player/manager, smashed the ball into the net to break double-figures. Bubwith didn’t just lie down and made it 10-2 with a nicely slotted goal. Cliffe midfield trio of Crowther, new signings Sean Bugg and Shaun Smith looked very good and the latter two had chances to get their first Cliffe goals but it Christopher Jackson off the bench made it 11-2, to the dismay of the Bubwith players and level Cliffe’s goalscoring record. Luke Crowther got the record-breaker and his forth to finish Bubwith and see Cliffe in to the Selby Cup Plate Final with a 12-2 win. Cliffe play Wheldrake on Bank Holiday Monday at Thorpe United’s ground in the LIVE4SOCCER Selby Cup Plate final before Selby Olympia take on Thorpe United in the LIVE4SOCCER Selby Cup Final proper kicking off at 1pm and 3pm respectively.